Sean Spicer, the new White House Press Secretary tasked with combating fake news – probably including this article, so don’t bother reading it – has mispronounced a couple of important names. Canada’s Prime Minister Justin Trudeau has been lovingly dubbed “Joe,” and Australia’s Prime Minister Malcolm Turnbull is now to be known as Mr. “Trumble.” If you’d like to know how Spicer might address you if you were the leader of a major country, you should check out the Sydney Morning Herald’s name generator. It’s also a useful tool to prepare for future press conferences. Be on the lookout for “Baranov Obelus” when referring to Barack Obama, or “Kimber Jonn Uncle” for North Korea’s Supreme Commander. 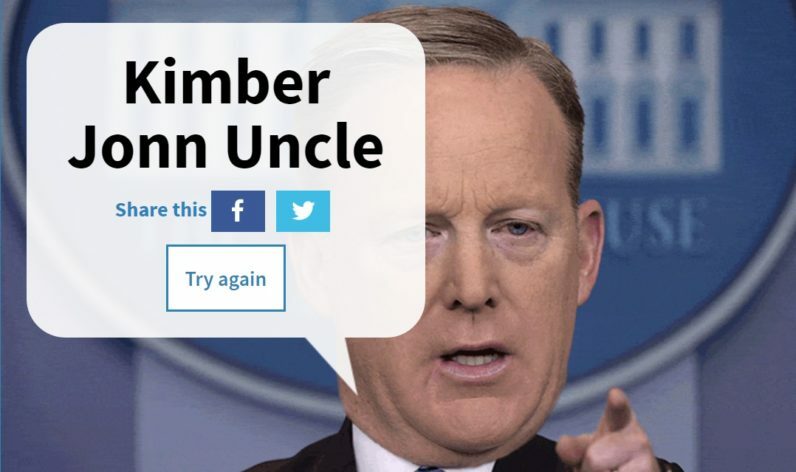 We hope Spicer doesn’t feel too bad though, as we’ve all made such mistakes. I mean, remember John Travolta and “Adela Dazeem”?